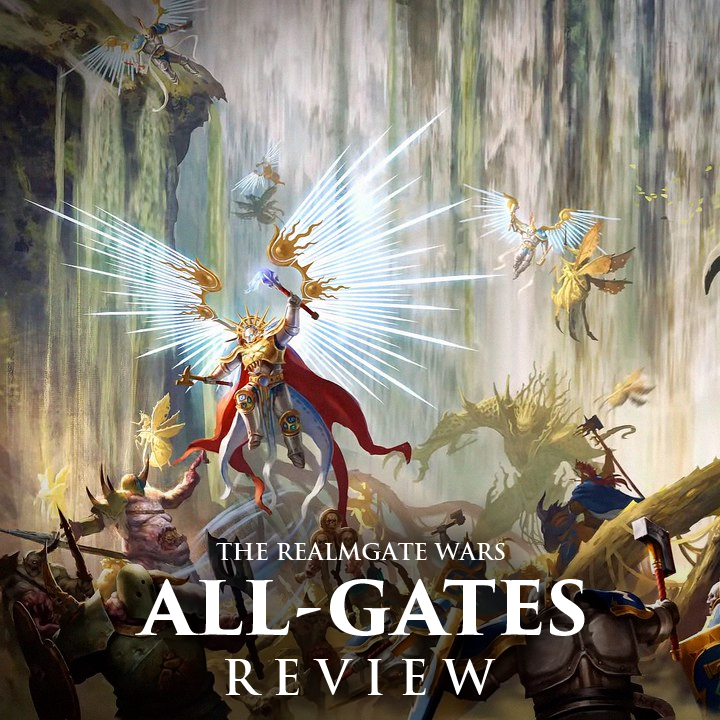 The Realmgate wars have raged for close to a year now and they are finally coming to an end with the climatic book All-Gates. The time has come for Sigmar to make his move. The Allpoints must be cut off at all costs. Will the forces of Order prevail or will Chaos reign? The fourth and final book in the Realmgate Wars campaign book series is finally here with All-Gates. Like its predecessors it is a nice hard bound book with a split image cover. This time we get an Ironjawz orruk on the top and Archaon wrecking face at one of the titular All-Gates on the bottom. This book comes in as one of the larger ones of the series which is perfect for the conclusion. Once we crack it open we get a brief recap on all of the events so far to catch you up to speed. While theoretically you could use this to jump into the series now, I would still highly recommend that you start from the beginning. It is useful as a refresher on what you have read before though for those of us who have been following the series. One interesting bit of information I found here is that we are finally given a hard number for one of the dates. According to this the Age of Chaos has been going on for close to 500 years. That's actually shorter then I thought. I don't know why, but for some reason I thought it would have lasted at least 1,000 years. We also get a cool brief history on the Allpoints and the All-Gates that lead to it. It sounds like it would have been very interesting during the Age of Myth, with a city larger then even Azyrheim occupying the center of the Allpoints itself. A bustling metropolis of trade and commerce between all of the realms. Now it's firmly in the control of Chaos, with Archaon's Varanspire constructed there. The chaos forces use the All-Gates as their primary way of invading and controlling the various realms. If Sigmar can cut off the gates it will make reclaiming the realms much easier. With that we are thrown into the battle for the first gate, the Genesis Gate in Ghyran. Alarielle has been reborn as a goddess of war and is now intent on leading her Sylvaneth forces on a war of vengeance to retake her land. Sensing that now was the time to strike, a multitude of Stormhosts were sent to Ghyran to request her aide. Together the combined forces of Sylvaneth and Stormcasts march out in search of the Genesis Gate which has been corrupted by Nurgle. There are some great battle scenes and accompanying battleplans in this part of the story. The Stormcast are of course led by the Hallowed Knights Stormhost since they have shed the most blood (lightning?) in defense of this realm. Strangely neither Grymn nor Gardus are mentioned at all. We do get to see Tornus though and I feel like he is given more to work with in this story then the last time we saw him. There is a really fun battleplan centered around him as he hunts for a Great Unclean One. Instead of pitting two players against each other, it pits two players against randomly generated monsters (or Nurgle demons if you have them) as they search the board for their target. I love battleplans like this because it adds more of a dungeon crawler/RPG element to the games of AoS. I am honestly very keen to give this one a try. I even have plenty of Nurgle demons. Their story comes to a climax as the forces of Order lay siege to a massive Nurgle fortress built around the gate, which is now a waterfall corrupted by Chaos with toxic sludge. It's a very intense battle involving the Celestant-Prime, Alarielle, and the Glottkin. This bit has one of my favorite pieces of artwork from the book, with a depiction of the Nurgle fortress that looks like maybe it took some of its inspiration from the massive Nurgle display at Warhammer World. After the Realm of Life we move into Chamon, the Realm of Metal. Here the Mercurial Gate is protected by an ever shifting fortress that's all but impregnable. The description of it is really cool, with passages shifting and changing as armies traverse it, pretty much ensuring they will never reach beyond its walls. Inside the fortress is a vast lake of molten metal, dotted by islands which are linked by bridges. In fact, the fortress has only fallen once in history, and that was to Archaon during the Age of Chaos after many attempts. While Sigmar would love to recruit the aide of the Duardin, their god Grungni is still missing, so instead he recruits the aide of as many Fyreslayer clans as he can. While a huge army of Fyreslayers and Stormcasts assault the front of the fortress, a smaller army led by Thostos Bladestorm burrowed up from below with the help of the Fyreslayer's Runesmiters. Their goal, to breach on one of the interior islands and then split up to secure the All-Gate and open the front gates to the fortress from within. Suffice to say, all doesn't go as planned and the combined forces of Order find themselves assailed by the forces of Tzeentch, Arachaon and his Varanguard, and a massive godbeast. There are a couple of interesting story hooks dropped here that I hope they come back to later as well as what I think is a pretty massive shake up to the story so far. Once the Chamon story is wrapped up we get a brief teaser of what is happening in Hysh and Ulgu, the Realms of Light and Shadow. Not much is talked about, besides assuring us that the same kinds of battles are happening there for the All-Gates, but both Tyrion and Malaerion are still missing as far as Sigmar knows. The third section deals with the Mawgate, the gate to the Allpoints from Ghur. The concept of this gate is actually really cool since it resides within the gullet of a gigantically massive worm like creature. The forces of Chaos have chained it's mouth open so that they can constantly march through it, but it still travels from time to time, dragging its Chaos captors along with it. Its latest travels take it into a region rife with Ironjawz tribes who see the Chaos forces as a good excuse for a war and start throwing themselves at their defenses. This is a cool bit where one of the Megabosses lures the Khorne forces into a trap involving hungry giants and a giant chasm. Despite their best efforts the orruks start getting worn down and eventually the Stormcast intervene to help. Unfortunately for them the orruks don't want no stinking help and it devolves into a giant brawl between all of the forces. The ending to this bit is decidedly Orruky, as it should be. After getting a brief look into Shyish we turn to Aqshy where Sigmar's largest push to reclaim an All-Gate is taking place. Led by non other than Vandus Hammerhand reforged, the entirety of the Hammers of Sigmar Stormhost plus countless other Stormhosts march on the Brimfire Gate with the aide of the Fyreslayers. The fortress surrounding it is particularly formidable though, with eight separate fortresses, each larger then the last. There is also the little matter of Skarbrand chained in front of the gate itself and Ignax, the godbeast, coiled about several of the fortresses. Due to Khorne's wards, Sigmar is unable to directly launch an assault within the fortress walls, so must instead rely upon the old fashioned way of doing things. What ensues is an epic siege as the Stormcast battle their way through the rings of fortifications. If they can turn the wrath of Skarbrand and the power of Ignax to their advantage though then they just might be able to take the gate. I was really happy to see Vandus back, and I hope we get some more personal stories with him. I am really interested to see how the reforging has affected him since he was so concerned about after seeing Thostos. I would also really like to see him and Ionus back together. The conclusion in Aqshy is frantic, epic, and thoroughly engrossing. With that the Realmgate Wars come to an end, and a new era in the Age of Sigmar begins. What awaits us now that Archaon's stranglehold on all of the realms has been loosened, and what is to come in Hysh, Ulgu, and Shyish, the three unexplored realms. It's exciting to think about where this story could go, and it will also be very interesting to see how the results of the Season of War summer campaign play into it. This is a great ending to what started in the Mighty Battles book, but is by no means the end of the story, since there are plenty of threads left unexplored and cliff hangers to flesh out in the future. The artwork throughout the book was once again just as good as we have come to expect from GW. What really impressed me this time though were the painting and hobby guides. Along with the usual guides, like how to paint a Tree-Revenant and Dracothian Guard, there are also some great terrain guides. The first one shows you how to paint the Sylvaneth woods in the same way as theirs, with a ghostly, magical look to them. They also show off a cool conversion involving some of the Storm of Magic scenery. There is another one showing how to make a Realm of Battle board look like an old battleground in Ghur with the use of some spare skeletons. The one that has me really excited though is when they show you how to make the sulfur pools of Aqshy. This is completely scratch built with random hobby supplies like spackle, and overturned bases, although they say you can use anything similar like bottle lids. It looks great and reminds me a lot of their old scenery guides that didn't all involve a pre-made kit. I'm excited to see them go in this direction again and hopefully they will continue. The scenarios are all really fun looking for the most part. There were a few that seemed like they could become a bit of a grind, but most of them kept the victory conditions varied. I mentioned one of my favorites earlier with the monster hunt in Ghyran. I think I like this batch of scenarios better then the ones from Godbeasts. The amount of scenarios we have now is amazing, presenting us with almost unlimited options. There are even more coming in the General's Handbook too. The warscroll section has a couple of big hitters like Archaon, Gordrakk, and the Celestant-Prime. There's also all of the Nurgle demons warscrolls and the entire Sylvaneth line. The Sylvaneth ones are pretty cool because they look like the warscrolls we have come to expect, with a beautiful shot of the mini above it, and take up a whole page, or two in the case of bigger monsters. The same warscrolls in the Sylvaneth book are more like the army lists of old like I mentioned in my Sylvaneth review. Both are great, and I honestly don't know which way I prefer more, but at least this way your itch is scratched regardless. Of course none of the Allegiance special rules for the Sylvaneth are in here, just the unit entries. For the warscroll battalions we are given a good selection, with all of them following along with the narrative from the book. There are a few really cool ones in here, and I'm sure everyone will find one or two that they like, so long as they play these factions. One of my favorites involves a small force of Fyreslayers from the Aqshy story. There is also a rather good one for the Stormcast featuring a bunch of Prosecutors and Venators from the Ghyran story. We don't get any of the battalions that give you rules to represent a special character, which would have been nice, but in the end it's not a huge loss. I think I have to say that this is my favorite campaign book so far, finally pushing Quest for Ghal Maraz out of that spot. There is so much going on and everything is huge and epic and extremely important to the story of AoS. There isn't a single bit of filler in here and to be honest they probably could have made it even longer without running that risk. The quality of the hobby content with the guides is fantastic, and continues on the trend from Godbeasts with including scenery and table guides. This is definitely a must read for every AoS enthusiast. If you are only going to get one book from the Realmgate Wars series this would be it, but you really should read the rest as well. The Realmgate Wars end on a high note and in a suitably epic send off.